The working students from Brek-n-Ridge Farm arrived at the Emmet Fairgounds for the June Twilight Dressage and Jumping Series. Taking home some blue ribbons was Rachel Hughs, a second year working student for Karin Offield. She was riding Zorro, a lovely black gelding currently in training at Brek-n-Ridge. Close behind with a second placing was returning student Mary Otto and her summer horse Annie. Mary and Annie then left the Dressage field and entered the Jumping classes and won some respectable ribbons in their first jumping show of the season. Mary and Annie will be competing this summer around the Northern Michigan area. Working student Hannah Ernst handled from the ground the Brek-n-Ridge pony Topper – a new addition to the barn this summer. Topper is a quarter horse Hackney cross and is considered a medium sized pony and he was well behaved and a gentleman at his first show. 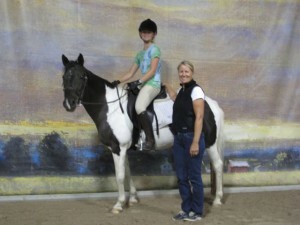 He is also used for the YMCA Riding program at Brek-n-Ridge Farm.